It's a thing of beauty to put on your hiking boots and wander across the mysterious planes of Africa, to go and see the majestic beasts that rule the lands gallop and pounce within the long grass and open planes. 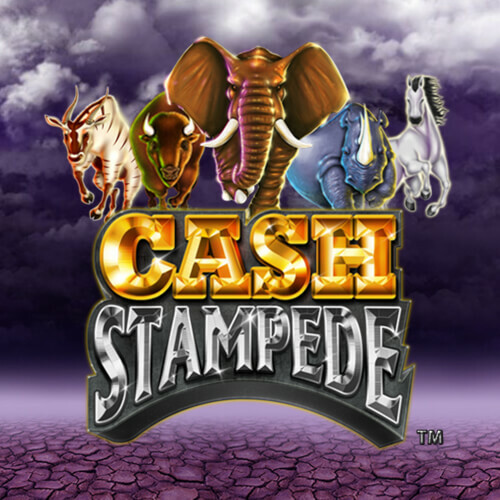 NextGen came up with the brilliant idea to create a slot game that can bring that sensation into the comfort of your living room, a slot game that they've named Cash Stampede. This 5 reel video slot aims to entertain people with the video of the big 5 stampeding across their screens, and giving them big rewards at the same time. You won't have to book an expensive ticket to fly out to the continent once you have this game saved on your favourite device! A casino game developer needs to do more than just follow the game format of a slot game, or just hand out big payouts. They also need to make sure that every element that they implement in their iGaming products are top quality, that means that their graphics, audio features, and even their narratives have to exceed the players' expectations. This is what NextGen is able to achieve with flying colours, the developers that have gained a positive reputation amongst their players, and the casino industry as a whole. Their achievements can be seen in the state-of-the-art technology and high-end graphics that they put in Golden Mane, Cleo's Wish, Merlin's Millions, and even Cash Stampede itself. Once Cash Stampede loads up on your laptop, tablet, or smartphone, you'll really feel like your venturing in the long grass fields and planes of the African Savannah. Not only will you be rewarded with the experience of witnessing some of the animal kingdom's most loved citizens, but also some big prizes when you get some on them in a winning combination on the 5 reels. The Elephants, Rhinos, Bisons, Antelopes, and Horses are the base symbols that you'll need to keep an eye on. But there are other special symbols that you'll need to keep an extra eye on. Cash Stampede WILD: this symbol will substitute all of the others except for the Golden Bonus SCATTER Coins. It will also activate the re-spin feature where it will turn into a sticky WILD. If 3 of these symbols appear on the reels, you'll win 8 free spins where all of them turn into Sticky WILDS. The more Cash Stampede WILDS you see on the reels, the more re-spins you'll win. Golden Bonus SCATTER Coins: If you get 3 of these symbols on the 2nd, 3rd, and 4th reel, you'll win a prize that's 50x your original bet. There aren't a lot of BONUS FEATURES or bonus rounds that can help boost your winnings in this game, but with the large RTP rate of over 96%, do you really need a lot of features to help you win more than what you've originally bet? NextGen has received many positive reviews over Cash Stampede, and you will regret it if you don't give yourself the time to play this game today. So, what are you waiting for?